Growing up, the family pet was a dog that lived to be twenty-some years old. For each of those twenty-years, he kept a tradition of choking on crumbs as Popaw was blessing the holiday meal. I don’t think Popaw was ever aware of the occurrence based off of the lengthy prayers and the whistling sound of his hearing aid. My dad and brother could keep completely straight faces and bowed heads. My concerned mother would always be nervously looking at the dog to see if he was going to finally croak over, while Nan would be giving me the stank-eye from across the table. I’m the baby, and perhaps I am also the immature one who couldn’t quit laughing uncontrollably. Since the many days of Winnie the Poodle, my parents have attempted to fill the curly-haired void with a larger breed. Kato shows a lot of promise for Favorite Dog Ever, but he probably won’t take the Longevity Award from Winnie. Maybe he will surprise us all though, as he’s much more respectful in the religion-department. Another Hamilton Holiday Tradition of sort is the reoccurring chatter over pecan pie and coffee. Popaw will momentarily put a pause on recapping military memories and talk of the science between sleepiness, tryptophan, and turkey he read about in AARP Magazine. Is there a bit of predictability headed your way Thursday? Sometimes I find comfort in routine. However, something that does need shaken up for me is the train of turkey sandwiches that are sure to come after the big meal. Switch it up with this poultry (chicken or turkey) pot pie recipe. Another plus: only one skillet to clean up! Happy Thanksgiving! If you have some leftovers this Thanksgiving, you’re in luck. 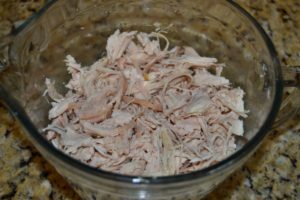 Start with about 3 cups of shredded turkey. Preheat oven to 375 degrees Fahrenheit. While doing this, go ahead and put the butter in your skillet to melt. Cook a microwavable mixed veggie blend according to package instructions. Drain, and add to turkey. Also stir in cream of chicken soup, salt and pepper. Once the oven has preheated, pull skillet out and add melted butter to large bowl and incorporate into turkey mixture. 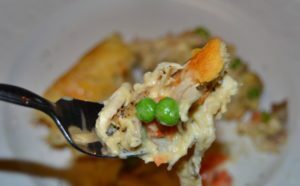 Being mindful of the hot skillet, pull crescent roll pieces apart into rectangles (2 triangle pieces will be the rectangle). Lay in skillet in a cross pattern, with edges up over the skillet as shown. Then lay the remaining rectangle crescent pieces in the gaps, creating an “x” as shown with rectangles up over the skillet edges. Pour in turkey mixture to center. 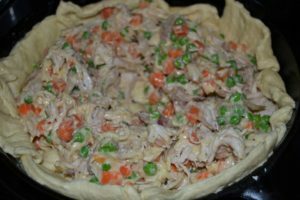 Bake in the center of the oven for about 20 minutes, or until crust is golden brown. Let cool for approximately 10 minutes before slicing and serving. 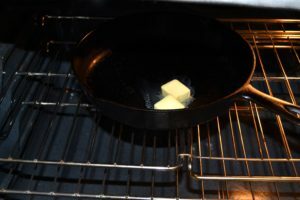 Place butter in cast iron skillet and place in oven on middle rack and begin to preheat to 375degrees. Cook veggies in microwave according to bag instructions. Drain. 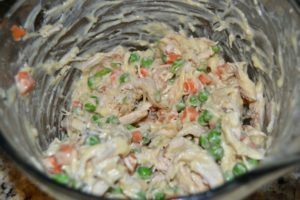 In a large bowl, stir together shredded chicken or turkey, cream of chicken, veggies, salt, and pepper. Pull skillet from oven when heated to 375. Pour melted butter into large bowl and stir into with pot-pie mixture. 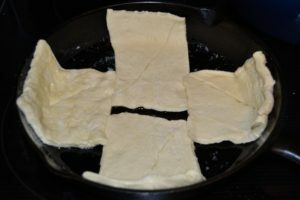 Being careful working with the warm skillet, place 4 crescent roll rectangle pieces in an “x” shape, leaving some of the dough hanging over the skillet edges (see picture), then work remaining 4 crescent roll rectangle pieces in a “+” shape with excess over the skillet edge (see picture). 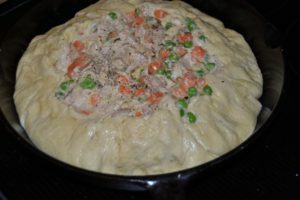 Pour in pot-pie mixture. 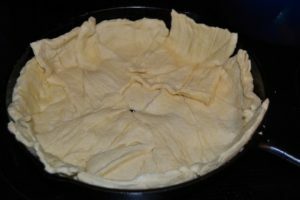 Pull over the edges of crescent roll. It will not cover completely, which is expected. Bake for approximately 20 minutes or until golden brown. Cool for a few minutes before slicing and serving. Enjoy! 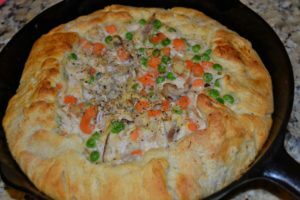 Cannot wait to try this Poultry Pot Pie…..yuuuummmmmm! !